"How long is your game?" That used to be the tough one. That used to be the question a video game creator could hardly give an answer to without birthing a scandal. I see all these questions about diversity in gaming these days, about women in Assassin's Creed or gay marriage in a Nintendo game. Hell, I hear myself asking these questions sometimes and see the game developers and executives to whom I'm talking stiffen up or cast their eyes at the floor. They sense a trick or a trap or, simply, a can't win situation. Whatever they're going to say about whether their game is diverse or not is going to piss someone off. It's a far more important topic than game-length, though, especially if you're someone who'd like to see more people who look like you or look like the people you see every day in more of the game you play. But lately I've heard a call for game reporters to just stop asking about diversity, to stop nagging about social issues. I've seen a call for game creators to stop answering, to just shut up, to stop doing more harm with every word they say. I don't think this is the correct path. Consider this a vote for more asking of the diversity question and more answering, too. Because I've seen the cycles of mistakes and misunderstandings broken before. Because I've seen other too-simple questions and other too-flippant answers lead to more sophisticated games. I think we—the game reporters, the gamers, the game developers—are in another awkward but essential moment of figuring something important out together. When the diversity question gets asked, everyone is going to freak out. That's going to keep happening for a bit longer. But I think it's something we're all going to get through—and get through for the better, the more the asking and the answering continues. The diversity question that keeps getting asked these days can be simplified to "how diverse is your game?" That question is usually based on an assumption that the more diversity there is in a game the better. That's a pretty good premise, though even that's not an absolute, not if, say, the game really does need to be just about white guys to make a point or not if the game's creators and audience would be better served if, this time, the lead character should only be a woman or a deeply religious person or senior citizen and not giving the player the option to change that. The diversity question leads to so many more questions: Does it suffice if the supporting cast is diverse? Will it improve the game if the gender or ethnicity or sexuality of the playable lead character can be switched by the player? If the game is diverse, is it diverse in a smart way or is it just rife with stereotypes and tokenism? Does diversity ever serve the player at the expense of the game design? Does it matter? I believe these are good questions, and I know they can't be answered in one breath. We shouldn't expect them to be. There's another question that follows the diversity question, the one that developers are having the most trouble answering: "If your game isn't diverse, why not?" The answers to that question, so far, have been rough. Rare is the assertion of authorial intent, that the game only lets you play as a guy because, damn it, that's what we wanted. Mostly, you're currently seeing a sheepish concession that, okay, the game could have been more diverse if not for a lack of time or money or manpower. Never do game creators publicly say it's because they didn't think players would care or care enough, but you have to wonder if that's part of the math. And you have to wonder if the responses of late change the math. If you're looking for signs of change in how gaming diversity is discussed, look at an otherwise standard list-of-features preview of the Ubisoft game Rainbow Six: Siege, published on Ubisoft's official blog just one day after the reporting about the lack of playable female characters in the newest Assassin's Creed hits its peak. The post is almost entirely about the gameplay features in the multiplayer hostage rescue-or-capture game. It ends, out of nowhere, with one of the game's developers, stating: "Of course, it won't only be female hostages. There will be both male and female hostages. I can't say how many there will be in total, but we will definitely have both." These are often complex issues, and sometimes the nature of the news will work against them. Headlines, pullquotes and soundbites won't always be entirely helpful in working toward the understanding we all need to gain about if, how and when gaming diversity matters. That's just their nature. I'll always want a longer answer, a more personal one, an honest one. It's never easy. 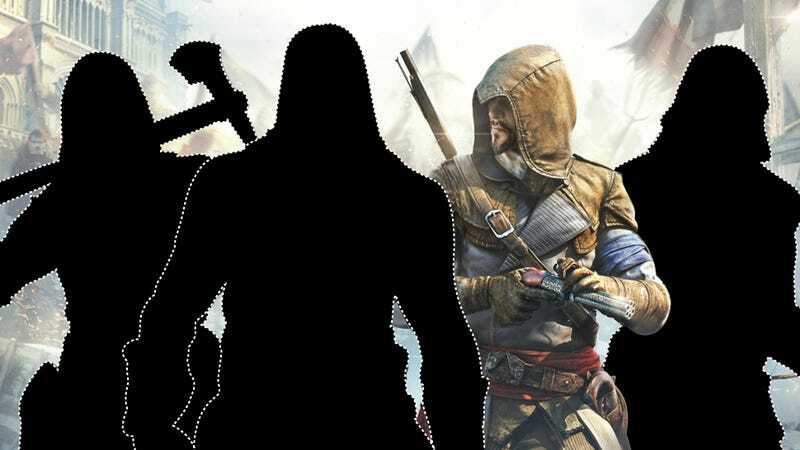 Look at the many ways Ubisoft's Assassin's Creed developers tried to explain the lack of playable women in their games or when the creative director of the new Far Cry tried to brag about how, despite cutting an option to play as a woman, the game's supporting cast is full of women. (As is so often the case, the headline—"Far Cry 4 Is 'Packed to the Gills' With Women, Says Director" reads worse than the developer sounds in the video the quote is from). What would a good answer to the diversity question look like? I recently asked the diversity question to the creators of Splatoon, a new all-ages multiplayer game from Nintendo involving characters who shoot globs of paint. They had it pretty easy, since their game lets you play as boy characters or girl characters. "Obviously, since this is meant to be the stand-in for you, we want players to choose the character they want to play as," the game's producer, Hisashi Nogami, told me through a translator. "And that's the reason we had both male and female characters in the game." You can really play as whoever you want, he added: "We don't see any reason for people to have to follow their own gender in this game." Nogami's company, Nintendo, however, stumbled to answer the diversity question when it came to excluding gay marriage in the comedic relationship-simulation 3DS game Tomodachi Life. This past spring, that omission triggered some gamer complaints and a pair of Nintendo statements, the second a pledge to, in the future, "strive to design a game-play experience from the ground up that is more inclusive, and better represents all player." Longer answers are better, as, generally, are the ones you can get in person, but that's only if people will answer you. Unfortunately, I have to count the explanation behind the omission of gay marriage from Tomodachi Life as the one topic I've ever asked Nintendo's developers about in person that they didn't answer. I tried to find out about it last month during an otherwise-fruitful interview at the Nintendo booth at E3. I put the question to Shigeru Miyamoto and Shinya Takahashi, Nintendo's top two men in charge of game development, but before I could get it translated, a U.S.-based PR representative cut in: "You know, to be honest, all we have to say is the statement we issued a couple of weeks ago." And when Miyamoto asked, in Japanese, for the question to at least be translated for his colleague Takahashi to also understand, I still didn't get an answer—not even when I pressed one more time. A year earlier, Miyamoto had been game to talking about playing as women in more Nintendo games and had even volunteered the prospect of playing as a gay character. This time, however, we moved on. During that same week when I was talking to the Nintendo developers, I found myself sitting with Andrew Wilson, CEO of EA, a company that has made prominent games starring women, has made games that included gay marriage and games that allow players to pick their gender, ethnicity and sexuality. And, sure, we'd get to that, but I was curious if the company's new cops-and-robbers game, Battlefield Hardline, would include playable women. He said that the game that ships in October would not. "It's primarily a male-driven drama story at this point," he said. "but as I think about the future storyline and the ability to inject episodic-type storylines into that world over time, I see no reason why we wouldn't have female-driven storylines through that.... potentially yeah." Is that a good answer right there? We'd have to see the finished game and decide for ourselves if it really is fine without playable women. That's key, since our first look at E3 is only part of the process. We've asked questions. We've gotten answers. But we also need to play these games. Wilson shared this agreeable explanation about the company's creative directives, or lack thereof, on diversity: "As we think about developing a game, our creative leaders have the opportunity to build the games they want to build and build for an audience of gamers they believe will play their games. We are seeing more and more female gamers playing our games—games that you would traditionally played by males only and games you would think would traditionally played by females only. We're seeing a much, much broader shift around that and their role is to bring great game experiences for the people that play them. As a result of that, they build plans and tools and technology and pipelines and characters and storylines that fulfill that need." The old game-length question stopped perpetually leading to outrage once it had been asked a lot. It only stopped creating blazing headlines once all the true or half-true or false answers had been tried and once we'd all played enough of the games about which it had been asked. Today, you'll see the occasional game developer get in trouble with releasing too short a game, but the scandal of game length has mostly settled into the steady-pulsed understanding that some games are long, some games are short, some games are good, some games are bad, not always respectively. We're not quite at the same level of understanding of diversity in games, and I wouldn't expect us to be. The length of a game may involve issues of value and aesthetic quality. Diversity is far more important, and much more complicated. It can affect aesthetics, yes, but it can also affect the people who play games and how we think about the work we've expected to entertain or engage us. I suspect we need to live through a few cycles, see which games really were worth getting outraged about, which excuses were legit and which were not. We need to see which games got an unearned pass because their tokenism passed for diversity and which didn't get the credit they deserved for being diverse in unexpected ways. We need to see if today's excuses and explanations hold up or fade in the years to come. We need to see who plays and who doesn't. We need to see what hurts games and what makes them more beautiful. We need the diversity question to keep getting asked, and we need to be listening for complicated answers. I want to see this through, and I suspect we'll all come out the other side understanding games, the people who make them and the people who play them a little better for the effort.